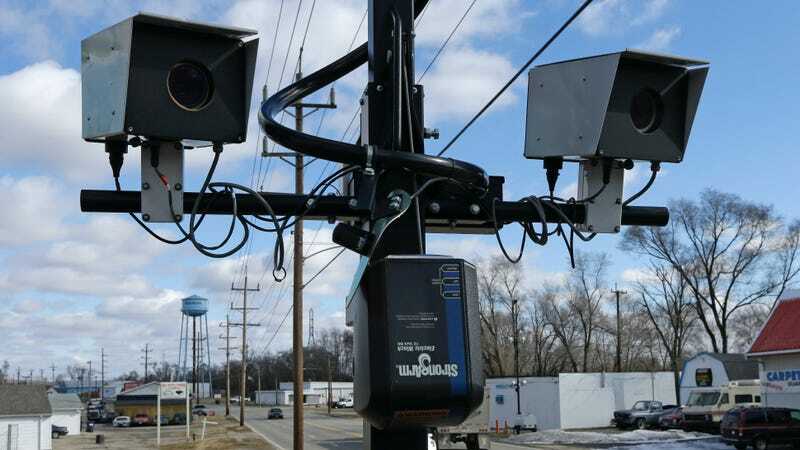 Speed camera used in Ohio. A state representative in Rhode Island wants to get rid of speed cameras entirely after municipal courts were flooded with hundreds of motorists protesting tickets issued by new school zone speed cameras in Providence, reports the Associated Press. Rep. Anthony Giarrusso introduced legislation last week that would remove all speed and red-light cameras in the state. Giarrusso, a Republican representative from East Greenwich, truly hates the cameras as much as we do. He describes them as a “government cash grab” to the AP, and it’s certainly sounds extremely profitable for Rhode Island. Just five new school zone speed cameras in Providence issued 12,193 new tickets in a period of only 33 days, with each ticket costing $95 for speeds over 11 mph over the speed limit. Naturally, hundreds of people came in to protest these, bogging down the local court system. Over 2,600 tickets were on the docket Monday at the Providence Municipal Court, which usually only sees around 300 people per day, according to WPRI-TV. Many of those people are likely innocent as well. Giarrusso believes that camera-generated tickets are inherently unfair, as the the ticket automatically goes to the car’s owner. That owner may not even be driving the car. As much as I don’t like interacting face-to-face with a police officer, at least they can confirm that I’m actually driving my own car. Keep fighting that good fight, Giarrusso, and maybe propose to raise a few speed limits out in the boonies while you’re at it. Thanks in advance.